The Anglophile Channel is SPOT ON! 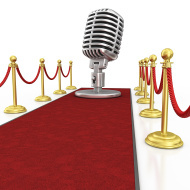 at all the hottest red carpet events! From film openings to award shows, we’re there to cover all the best in British entertainment news! What is Sam Heughan sweating over? What prize does Caitriona Balfe think she deserves for working with Sam Heughan? Downton Abbey’s Lesley Nicol and Laura Carmichael tell us if there’s going to be a Downton MOVIE! Harrison Ford: Will There Be Another Indiana Jones? Peter Capaldi, How Long Will He Play The 12th Doctor? Henry Cavill (Superman) Tea or Pint? Britain’s hottest export, Benedict Cumberbatch, talked to the Anglophile Channel twice this year! Rob Brydon does his best Michael Caine impression! Steve Coogan does HIS Best Michael Caine impression! George Clooney chats about his next project…on Broadway? Sir Ben Kingsley has a little fun during our interview! Beautiful Jane Seymour looking as youthful as ever! Visit us on YouTube for MORE Red Carpet interviews! thank you very much for your great work in conversation with the outstanding people! I am from Russia, Ekaterinburg. Your interviews are so kind, full of special humor sence and in so good English! I have 2 children and no very much free time. But nevertheless I use to take time for me and enjoy watching your reports on youtube. They make me cheerful and optimistic)) And I would like to thank also Mr Richard Armitage fot his great talent and fine humor. If you don’t mind, thank him please from me! His respectability everywhere he is and absolutely attractive appearance give hope that the ideal men exist) A man, a voice that can change the world! Thank you very much for your replay, kind and surprising! It is a good idea about the Tweet conversation. But I won’t be tiresome. All celebrated persons suffer anyhow the over raised attention from the fans. I just want to let Mr Armitage know, how great his talent, brilliant his performances are and what a noble man he is! You make fascinating reports about cinema theme. Do you have any thoughts to visit Russian Red Carpet and get acknowledged with our great actors? I’m sure, this experience would be very exciting. Especially when it is widely known that Russian and British theatre schools and methods are most qualitative.